Rob is currently an Asst. Band Director in the Kiski Area School District, a suburb of Pittsburgh, Pennsylvania. His responsibilities include directing the high school Symphonic Band, Intermediate School Jazz Ensemble, and High School Jazz Ensembles. Additionally, Rob is the director of the acclaimed Kiski Area High School Marching Band. 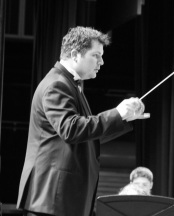 Formerly, Rob was director of bands at Norwin High School (2007 – 2013), where the Norwin Wind Ensemble, Norwin Jazz Ensemble, and the Norwin Marching Band were under his leadership. Rob received his bachelors degree in music education from Youngstown State University and a M.M. in electronic music composition from Duquesne University. Rob owes much of his success to numerous teachers/mentors including Stephen Gage, Michael Crist, Dave Morgan, Joseph Wilcox Jenkins, Lynn Emberg Purse, Patrick Burke, Kent Engelhardt, David Bertman, Bruno Zuccala, Robert K. Matchett III, Varden Armstrong, Shawn Vondran, Don McKinney and Scott Koter. Rob has twice been recognized by the St. Vincent College Great Teacher Recognition Program" and was a Grammy Foundation music educator award quarterfinalist. He is a current consultant, clinician, designer and music arranger in the Pittsburgh area. ​Rob currently provides design, program, and instructional resources for band programs. He is an adjudicator for pageantry and concert groups across the country, as well as a trombonist in the Pittsburgh area. Performance experiences include performances with groups such as the Youngstown Symphony Orchestra, Balcony Big Band, and The Cavaliers Drum & Bugle Corps. In addition to performing, Rob is a composer. His works have been premiered at the 2006 Ohio Music Educators Association Conference, the 2007 & 2016 Pennsylvania Music Educators Association Conference, and on athletic fields by numerous marching bands. Rob currently resides outside of Pittsburgh, Pennsylvania with his wife Bethany and children Gavan & Maia.